On the 30th of March Salekhard became the center of culture, sports, friendship of all northern territories of the planet. Sportspeople, soloists and collectives, photographers, spectators and participants of the main polar spring holiday – the Reindeer Herder’s Day gathered under the dazzling sun on the snowy banks of the river Polyabta. Dozens of hospitable choums are set on the ice of the river; northern gifts and other necessary items are sold, guests are treated to tea and fish soup and “shashlyk” (barbeque) smells tasty in pavilions and along the main “street” of the holiday. Speech in many languages sounds, elegant ethnic costumes are seen here and there, a huge mammoth doll moves in the crowd. All participants of the holiday smile and capture happening moments. Thanks to Wi-Fi delivered here for this day, the picture becomes available to any resident of the Earth. 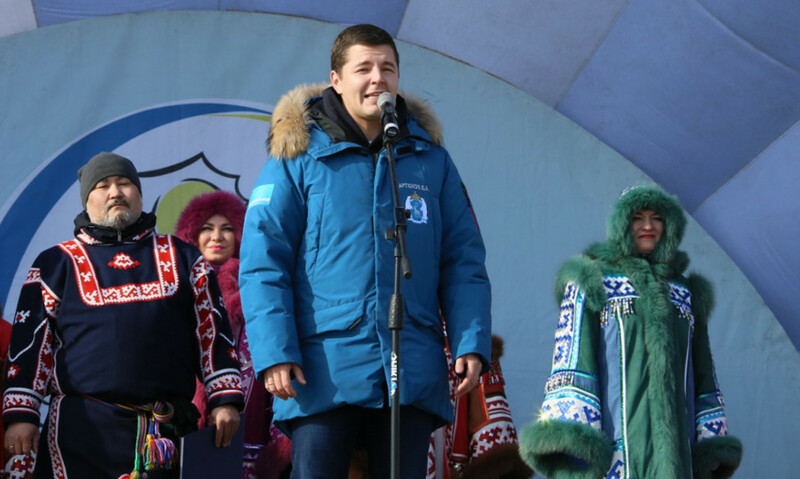 The president of the Association of indigenous peoples of the North “Yamal is for descendants”, a deputy of the Yamal Parliament Edward Yaungad sincerely wished the heroes of the occasion – reindeer herders for strong reindeer, healthy children and family wellbeing. He read the welcome address from the chairman of the Legislative Assembly of Yamal Sergey Yamkin: “Dear residents and guests of the capital of Yamal! I am sincerely glad to welcome you on the hospitable Yamal land on the occasion of the traditional holiday dedicated to the Reindeer Herder’s Day. It is celebration of identity of the North and people’s talents, which gathers everyone, who truly loves and admires the northern region and traditions of their ancestors. I sincerely wish all the participants for good luck and brilliant victories in sports and creative contests, in life and work. Let beauty and energy of the Yamal northern land warm everyone and leave good memories in hearts about people of selfless work and strength of their spirit”. The head of the administration of the regional capital Ivan Kononenko said that he was sincerely glad to see his countrymen and everyone, who had come to be a guest on the favorite holiday. He shared the joy of the participants and wished them for the most important thing – good mood, bright impressions, beautiful competitions, fair judging and all the best. People are happy to communicate with each other, noticing familiar or interesting, pretty faces. For example, a deputy of the State Duma of the Russian Federation from Yamal Vladimir Pushkaryov told a correspondent of the news agency “Sever-Press” that he preferred this holiday to staying in Moscow. “I think that indigenous peoples fantastically decorate life of town-dwellers, and we are all much closer to each other than we sometimes think. I wish everyone for success and good health”, said the deputy.